Vivid color from spring through frost! 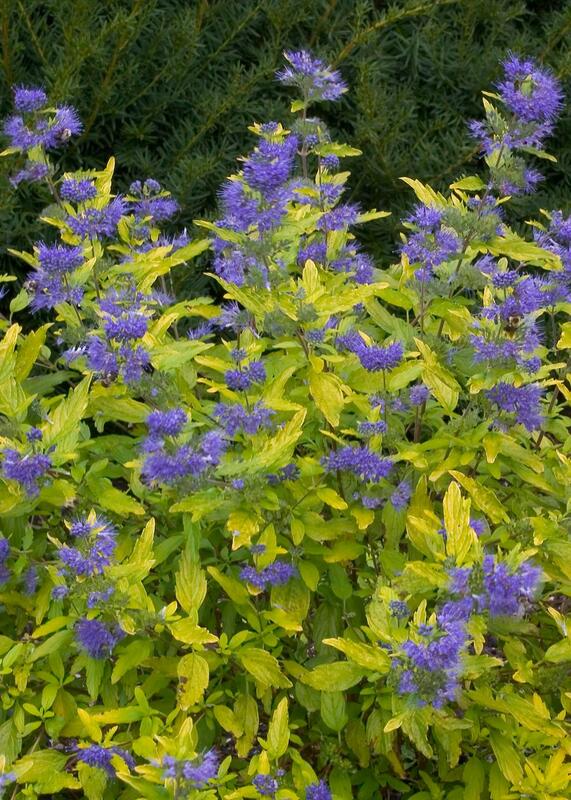 Lil' Miss Sunshine® bluebeard is one of the most colorful garden plants anywhere. Spring brings bright gold foliage. 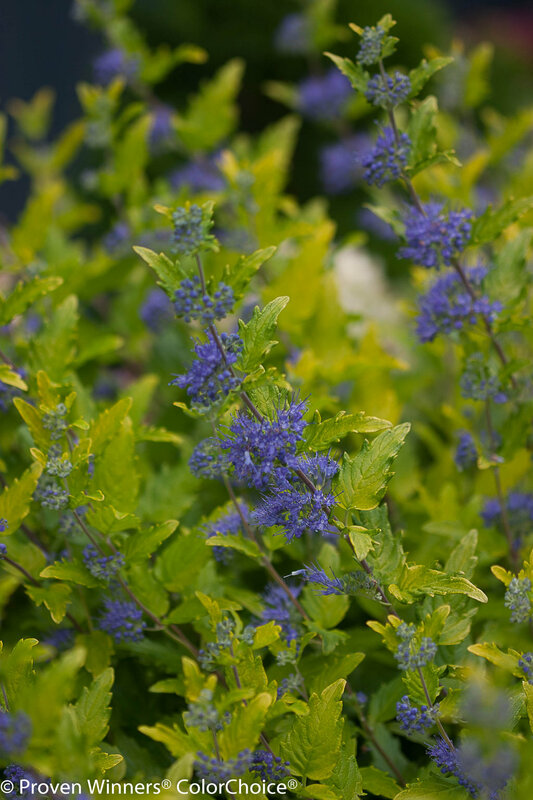 In late summer, blue flowers begin to appear and persist through mid-autumn with unforgettable contrast. Its late season bloom time brings interest to the landscape when not much else is blooming and the nectar-rich flowers provide food for pollinating insects and hummingbirds. 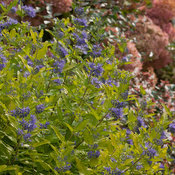 Works well in perennial gardens or landscape beds. 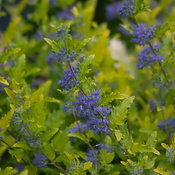 This compact plant is good for smaller landscapes and beds. 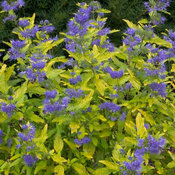 Excellent as part of the mixed border or in the perennial bed, it adds a shot of bold color to the late summer garden. This plant requires very little care. Prune in spring, only after the new growth has begun to appear. Cut back hard for best results; in Northern areas it may die completely to the ground. Tip die back is common after cold winters. The plant blooms on the current season's growth so will flower even if cut to the ground in spring. It does require well drained soil. Fertilize with a controlled release fertilizer in spring. Beautiful shrub with vivid color, bees love it, too. This plant is stunning. The bees love, love, love it but it poses no threat as the bees are so intoxicated by it they don't notice humans. It was planted and took off the very first season! This plant is an excellent value. Reliable, nearly carefree, with a unique color. Love it! 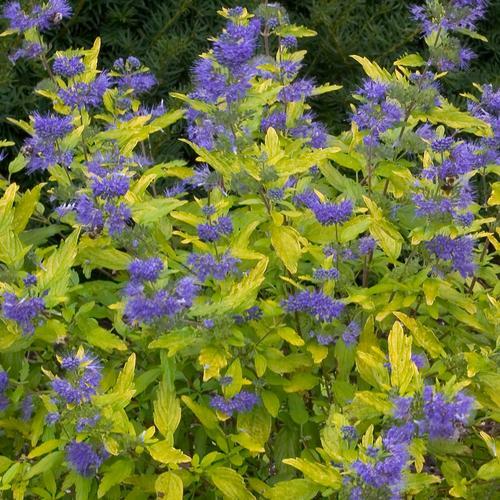 It is so striking in any garden with its brilliant bright yellow leaves and then the beautiful blue flowers in late summer. Absolutely no problems of any kind. 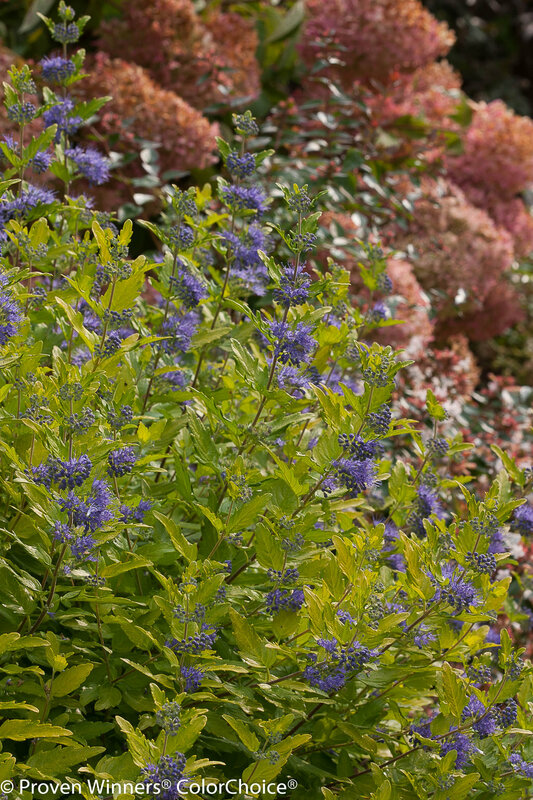 Reliable, beautiful, attracts bees and butterflies, great in shade or sun. Once established, shoulder high and gorgeous. Grows very well and fast. Flowers a beautiful blue, foliage works very well in arrangements. Can't wait to have more.